The Mission Monarch project aims at identifying the monarch’s best breeding habitats. How to find them? By spotting caterpillars on milkweed! In fact, caterpillars are breeding evidences, and hence are a good clue to find the most productive habitats. That said, you may also observe eggs, chrysalises and adult butterflies. 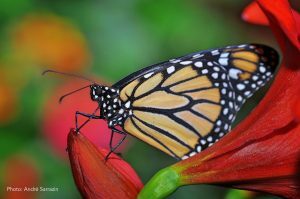 This page contains tips to find and identify monarchs at each of their life stage. Description Usually a single egg per milkweed plant, but sometimes several. Creme-coloured or yellowish, oval and slightly conical, covered in longitudinal raised ridges. Watch out for false eggs! Milkweed produces a sticky whitish sap that sometimes forms small bubbles on the leaves. Be careful not to confuse these droplets with monarch eggs! To distinguish between them, look carefully (with a magnifying glass): a monarch egg is covered in vertical lines. Small whitish bubbles, rather spherical. Different sizes, may resemble a monarch egg. Usually seen on milkweed plants,but older caterpillars move about looking for somewhere to pupate. Behavior Young caterpillars feed on the leaf, making semi-circular holes, starting in the centre of the leaf. After a few days, they start to feed on leaf edges. Description Turquoise-green, with gold spots. Gradually darkens until the adult colours show through the transparent case, about 24 to 48 hours before the butterfly emerges. Excellent camouflage! Pupae are difficult to spot in the wild. Often found elsewhere than on milkweed plants. Males show circular black spots on their hind wings.